← TRC #482: Coffee Enemas + The Physics Of Curling + Did The CDC Ban 7 Words? 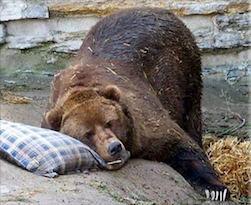 2 Responses to TRC #483: Mailbag + Raw Water + Do Bears Hibernate? I fully support your approach on advertising in the show. Having said that, an advertising free version would be really good. I currently have a $67/month podcast bill through Patreon and a few independents. The reason I think it’d be good for an ad free version is to allow people to donate so they can avoid listening to them. I can’t speak for anyone else, but here in New Zealand the vast bulk of the ads just aren’t relevant here. Have you done a survey of your listeners recently? Do you know the rough demographics? It may be interesting to see that. Even if it means getting advertisers that are likely to appeal to more of the listeners. Thanks for the feedback and the support, Gold. An ad free version of the show is a decent idea for people who support the show though it could very well be a bunch more work. I’ll have to look into whether we have the option to do it dynamically. Also, I know that there is some discussion of moving to some ads that are based on geolocation so, at least, they could be a little more relevant.